Join Take Root Milwaukee on Saturday, August 18th from 8:00 a.m. - Noon at Milwaukee Academy of Science (2000 W Kilbourn Ave) to learn all about the homebuying process! Over 20 trusted resources in the Milwaukee area will be available to help you start or continue on the path to owning your own home. Meet with lenders, neighborhood organizations, homeownership specialist and realtors. Staff from the Department of City Development (Real Estate and NIDC) will be available to share information on how to go about purchasing a home from the City and resources to help fix and maintain a home from our Strong Neighborhoods Plan. Whether you're in the market for a fixer-upper, a historic house, a vacant lot to build on, or are looking for resources to improve your existing home, we can help you reach your goals. Until then, continue reading more below about properties for sale, neighborhood events and updates, helpful resources, and homeownership opportunities! 2 BR / 1 BA • 863 sq. ft. Check out this single family home located in the North Division neighborhood. Enjoy a nice yard on the side of this home with endless amount of shade from the trees on this property. Designed by George Ehlers in 1901. This grand Queen Anne style duplex in Cold Spring Park has a new roof and gutters and is waiting for full renovation. Special feature is twin staircases that spiral around each other from the basement to the attic. 3,264 square feet of living space on a 5,640 square foot lot with garage parking at the alley. Must be restored as a duplex. Tuesday, September 11, 6 - 7:00 p.m.
Wednesday, September 12, 6 - 7:00 p.m.
Thursday, September 13, 10 - 11:00 a.m. In an effort to better equip the development community with understanding the permitting process in the City of Milwaukee, the Lunch & Learn Summer Series will explore current development opportunities and challenges. Mark your calendar to join us! Monday, August 20, noon - 1:00 p.m.
City Hall, 200 W. Wells St. Room 301 - B Third Floor. For a full list of upcoming workshops visit our Lunch & Learn website. Saturday, September 15, 9:00 a.m. - 3:00 p.m.
Milwaukee Safety Academy - Little Theater, 6680 N. Teutonia Ave.
Wednesday, September 19, 9:00 a.m. - 3:00 p.m.
Alderman Khalif J. Rainey is proud to announce the opening of Hip Hop Week MKE, starting Monday, August 20. The weeklong event will offer unique and positive experiences through networking events, conversations, health fair, and music. Click the link above to access the full schedule. Walk 100’s overall goal is to increase physical activity among residents while promoting the uniqueness of Milwaukee’s neighborhoods. Throughout the summer, Walk 100 partners with community organizations, elected officials, and residents to host walks in all corners of the city. Find a walk using the link above and join in on the fun! Artworks for Milwaukee and NorthWest Side Community Development Corporation have been working on adding some color to the MMSD North Basin at 30th & Congress. Join them on Tuesday, August 21st at 4:30 p.m. at the North Basin N 30th St & W Congress for their ribbon cutting ceremony as they unveil the new murals installed. 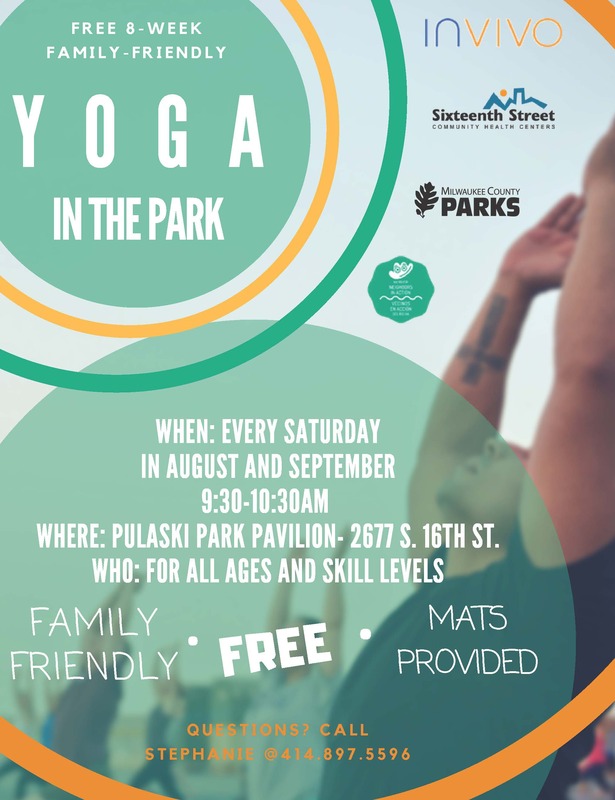 Join Sixteenth Street Community Health Center for FREE yoga at Pulaski Park (2677 S. 16th St) every Saturday in August and September from 9:30 a.m. - 10:30 a.m. Mats are provided and it's open to all ages and skill levels! Join the Harbor District for Harbor Fest on Saturday, September 8 from 11 a.m. - 4:00 p.m. outside of the UWM School of Freshwater Sciences (600 E. Greenfield Ave) to take part in activities like paddling lessions, fishing lessons, pet a sturgeon, bike tour, street games, and food & drink. Participate in the final open house for the transit oriented development study in Walkers Square from 11 a.m. - 2 p.m. at Tribeca Cafe 1318 S 1st St during Harbor Fest. Join Walnut Way for their annual Harvest Day Festival on Saturday, September 8, noon - 5:00 p.m. on 17th St. Live music, local food, and performers. Saturday, September 8th from noon - 5 p.m. on W National Ave between 33rd & 35th St. Join Silver City neighbors and business owners for the 7th Annual Silver City International Festival to celebrate the cultural diversity of the neighborhood through food, music, and dance. Every Thursday from 3 -6 p.m. June 21 - September 13 Near West Side Partners (NWSP) will be hosting a farmers market at 20th & Kilbourn in Avenues West. NWSP is committed to bringing fresh food options to the 50,000+ residents and employees of the Near West Side neighborhoods. Check out this story about what one group of neighbors created with a vacant lot in their community and the love that grew from it. This site is the westerly bookend to the Bronzeville Arts and Cultural District and serves as a gateway from I43. Traffic counts along North Avenue are over 20,000 vehicles per day. Easy access to and high visibility from I-43 are an asset.